I made my first quick proof of concept rc mod of the Lego Technic 42078 Mack Anthem truck to see which motors fit and how in the chassis using some spare parts I had. I did not plan to release any instructions or images about it as it was just a test and I will do a proper RC mod sometimes in the future. Since the instructions are available now I built the B model of the 42077 Rally Car as well. It is a buggy, following the design of the Beetle-based beach/dune buggies. The car does not have any special Technic features just the standard ones so I felt the need to spice up the review video a little bit 🙂 You can see all the motorized decorations in details at the end of the video. I would like to wish you all a Merry Christmas with this video and thank you for your support! 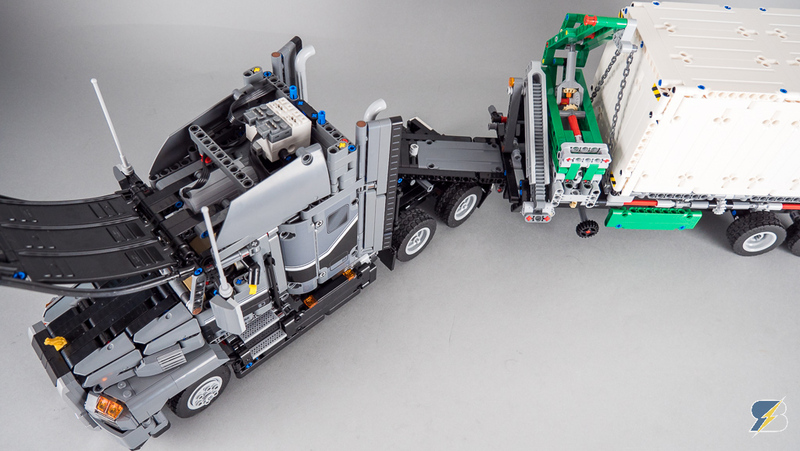 The Lego Technic 42078 Mack Anthem received additional rc functions with the lights and the motorized trailer, controlled by 2 SBricks. The light sequences of the container are also controlled by one of the SBricks. The trailer has 2 Power Functions L motors built in. Also tested with M motors but they could not handle the load. Please note that this is a test RC mod, so there won’t be any instructions for the time being. I’m planning to do a proper rc conversion and I’ll share that one in details. The Mack Anthem is the result of a new partnership between Lego and Mack Trucks Inc. The Anthem is the newest highway truck from Mack, introduced only a couple of months ago. The B model is a Mack LR garbage truck – instructions will be available later online. This MOC only uses parts from 42036 Street Motorcycle and 42039 24 Hours Race Car. I finished the building instructions for my buggy motor mod of agrof’s class 1 unlimited buggy. Please note that these are not complete instructions, the aim was to show you the main modifications I made on the car. There’s no part list either this time. I tried to highlight which part/sequence needs to be changed compared to the original build. I was using 2 BuWizz units to power the buggy motors, the units were replacing the seats in the cabin.